Yes, the gate has a 12v power supply that I will lower to 3.3v. And yes, I have NodeMCU (ESP12E). I found a project already done, but I’m struggling to change it. He is made to command a 3-wire servomotor and I need to command an on / off relay but the bad part is that I do not know programming, I try to change with tutorials. Once more, thanks for the information. I hear another wonderful thing, really want to be notified and at the same time can send an order to open the door. Can you share the project you already use? Can you share the project you already use? This was my starting point https://github.com/Gianbacchio/ESP8266-TelegramBot. Telegram bots are quite versatile. It’s possible to send commands to send digital i/o high or low, have user access levels, request data from sensors etc. But pleased be advised, Telegram bots are seen publicly so you need to make sure that your telegram chat ID is included in some kind of authentication check before allowing commands to be sent. I’ve integrated Blynk to control user access and user access levels ie. some may only be allowed to receive sensor data but others with higher user access may activate things. If you share your project with other people the are able to use the project without being able to edit it. Keep in mind, the project must be running on your smart device (e.g., smart phone) in order for your son and wife to access it from their smart device. And you have a pretty attractive project worth trying! Is your gate release AC or DC? You didn’t answer this question. 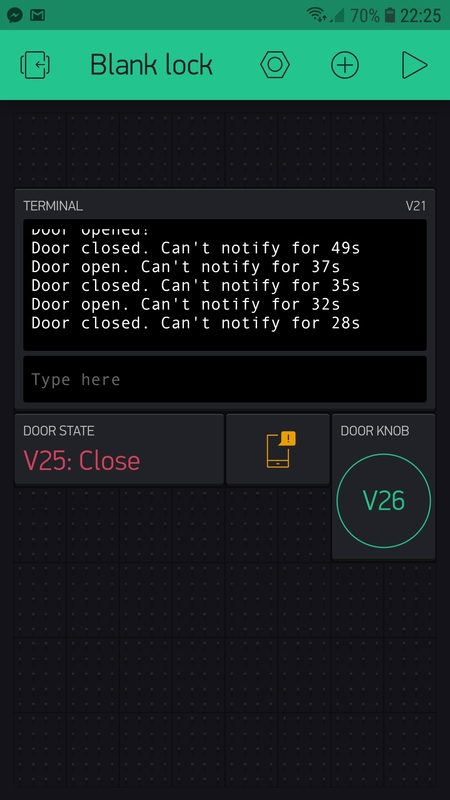 When your current gate release operates (assuming you have one) does it just click when opened and closed, or does it buzz while it’s activated? If you have some code already then post it (correctly formatted with backticks) and we’ll tell you if it’s a good starting point. That’s exactly what I want, anyway, it’s enough! However, I still have a question: now the application runs in the background and the messages do not come, the messages come only when I access the application interface, is it correct? My advice would be to get the remote gate release working correctly, then add-in features like notifications at a later date. Hello, the project is already hardware, and it’s already working that I need to add or change the on / off relay function instead of the servomotor. If I post here the Arduino code, could someone help me explain how to change the function of the servomotor in the relay? It depends on the code. we’ll tell you if it’s a good starting point. One thing we will need to know is whether the relay you’re using is active HIGH or LOW, and which GPIO pin you plan to connect it to. sorry for forgetting to answer your question. To be understood correctly, can I post here the link from where I took the project? which I used for a few months until the servomotor was damaged. Now I have installed an access control system rfid and for it I need to change the side of the servomotor with a simple push button push button that will actuate the button on the access control keypad which will drive the electromagnet on/off for 1-3 seconds. I’ve watched Part 2, 3, 4 and I see there are many interesting things to learn. The man who lives learning! for opening the door will go into HIGH. and GIPO 12 will be for relay control. // pin 16 is LOW. If the switch is closed (door too), pin 16 is HIGH. I asked but did not answer. Is it normal that the application running in the background does not receive sound notifications? These only appear when I enter the application! Nobody really can help me? I think you’ve probably lost some people along the way. Hello, I am new to this area and I would need your guidance. So, I want to build a project with ESP8266 12F and Blynk application. link from where I took the project? which I used for a few months until the servomotor was damaged. That’s a very different shift in position over the course of a few posts. If you’d have started by saying “I have this code which operates a servo, but instead I want it to operate a relay” then I think your system would be up and running by now. Greetings, I apologize for bad expression! 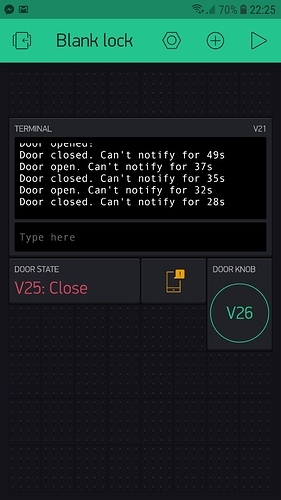 I have this code which operates a servo and a magnetic switch at the door, but instead I want it to operate a relay and a magnetic switch at the door instead of the servo. ( this is the truth ). And yes, the project is taken off the Internet a few months ago not done by me, becauseI do not know programming. Unfortunately, I do not speak English and so translated the google translator. versus project modification ,and that’s why I apologize again! Follow this with a digital write LOW for your relay pin, to ensure it’s not actuated. When you currently have servo.write commands, replace these with digital write statements to the relay pin. Make the relay HIGH to actuate and LOW to deactuate. Once you have this working, add a timer to hold the relay HIGH for the desired time then set it LOW again. I will try to follow this. One more question, Is it normal that the application running in the background does not receive sound notifications? These only appear when I enter the application! Is it normal that the application running in the background does not receive sound notifications? These only appear when I enter the application! Salut, ma puteti ajuta in aceasta probema? Am probleme de notificare cu ecranul închis. Versiunea Blynk 2.27.2. Setările telefonului sunt bune. Folosesc datele wi-fi sau mobile ( server Blynk cloud ). Deci, aplicația rulează în fundal, pentru a primi notificări trebuie să deblochez ecranul și să intru în aplicație. Telefonul este Samsung Galaxy A5 2017 cu Android 8.0.0 și Samsung Experience 9.0 Am încercat un alt Samsung Galaxy J5 2016 cu Android versus 7.1.1 versiunea Samsung Experience 8.5 și funcționează bine. Setările telefonului pentru permisiuni sunt făcute ca Samsung Galaxy J5 2016. Este cineva care a întâlnit această problemă? Curios este faptul ca daca ambele telefoane sunt conectate notibicarile vin pe ambele !